The Philadelphia Eagles will be facing the New England Patriots this Sunday at the U.S. Bank Stadium, home of the Minnesota Vikings, located in Minneapolis. Many viewers will be watching from the comfort of their homes but the select few have the opportunity to watch it live and in person. From an estimated 111.3 million fans watching the big game, only 70,000 will fill the seats of this massive stadium. They will be the few to witness the uniquely designed space made to resemble “ice floes colliding on frozen lakes.” Most TV viewers will only see the name U.S. Bank, whose corporate name appears on all sides of the stadium. They paid a whopping $220 million dollars for this exposure. The stadium will be well branded inside and out. Brands like Hyundai, Miller Light, Delta, Verizon and many more are sponsored throughout the stadium. Although most viewers won’t see the stadium, the power of social media will allow everyone to get a glance. The “pass-along effect” is a term mentioned in this article referring to people’s exposure to a place. The goal of this is for people to have a positive experience, in turn, leaving a positive impression on them and eventually leading to the posting of videos and photos that happen to show the branded space. This is an interesting approach to an event that is heavily watched. Only a limited number of people will be able to witness the full scope of the stadium yet the branding and sponsorship will still be seen by TV viewers across the globe. It makes you wonder how much these brands are paying to have their logo and branding seen and if they should be paying a whole lot more? 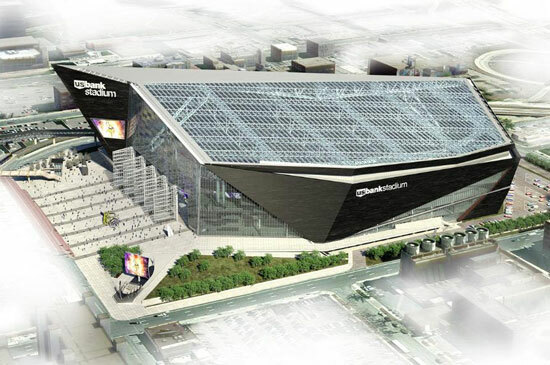 To read more about it and to see a breakdown of the Super Bowl LII stadium click here. Copyright ©, Pinnacle Advertising & Marketing. All Rights Reserved.